Justin Bieber is everything brand CK is about ”“ racy, young and deliciously controversial. The fellow cannot go through two sentences without giving you something to raise an eyebrow at. I am in Hong Kong, in the city’s older island of Kowloon, in a refurbished industrial space, waiting for JB to show up for a special appearance at the CK Jeans party. A couple of interesting local pop stars open for him and they are fun to watch (if you have a few drinks inside), but everyone there ”“ and the crowd is mostly filled with late twenty-somethings and upwards ”“ are feverishly waiting for the Bieber. Why? When he does land up, I see women old enough to be my mother fanning themselves. The boy is a testosterone-y cocktail of energy, good looks and that “bad fella” quality good women fall for. He rips his pants after the first song itself and asks the audience whether he should just change on stage. When talking about CK Jeans he says he loves the fit because it keeps his “junk in place”. And finally, he gives in to demands and rips his tee off and performs two songs shirtless. When he leaves in under two hours, everyone around me is dissatisfied. 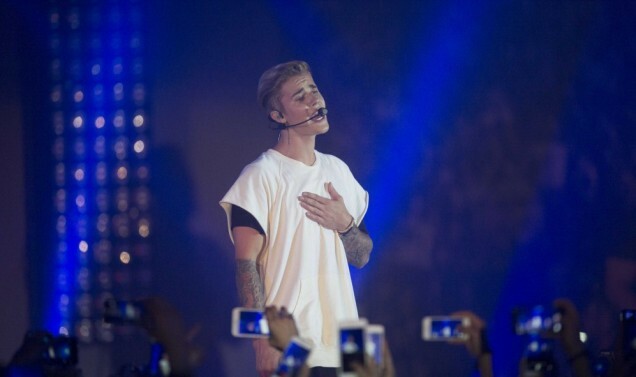 Bieber might not be the best singer of our generation, but he is a celebrity par excellence. He knows his audience, how to turn them on and how to keep them begging for more. A crazy woman had been tweeting to me to take her with me for the party because she has a vial filled with her blood that she would like to give him. She tweeted her request 150 times. That’s a kind of fanfare I don’t even understand.